Next to Hackbridge Railway Station gives the convenience of leaving your vehicle with us while at work or taking a day out to London. 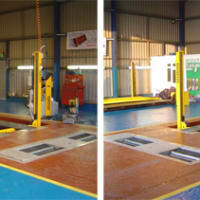 We have 2 class IV, V and VII MOT bays allowing us to test cars, vans, minibuses and mobile homes. We also have Full diagnostic equipment, Air Conditioning service equipment, Tyre and battery fitting services. Being a registered member with the Retail Motor Industry (RMI) gives our customers the piece of mind knowing we offer quality at the right price.